Call it the ‘Luck of the Irish’, or call it favoritism towards our fabulous readers. Either way we want you to know how much we appreciate your support. Once again, with the help of chickabug, we created an exclusive gift especially for you: Free St. Patrick’s Day Printables. What exactly is St. Paddy’s Day in a Jar? Basically a rainbow of happiness ready to burst straight out of a jar. I think that about sums it up. Using jars these days is a practical, yet adorable trend that we love. And I mean, who doesn’t have jars laying around? Go ahead, empty out that spaghetti sauce if you need to. 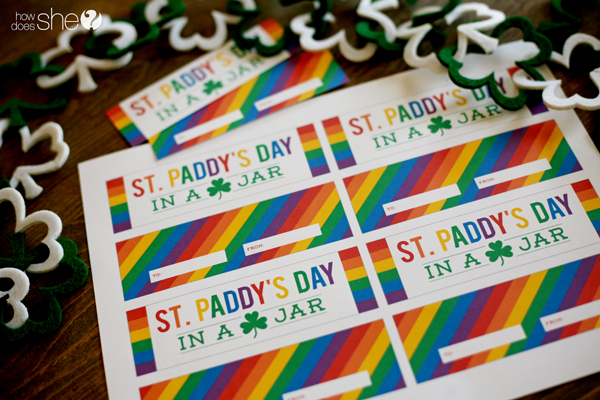 Grab this exclusive new free St. Paddy’s Day printable, fill the jar with a rainbow of goodness, and you are set. The colors of the rainbow are guaranteed to make anyone’s day a bit brighter. Perfect for a child’s teacher, a friend, a spouse, or even for your kids. I seriously can’t even look at the photos below without smiling. Here are a few Red, Orange, Yellow, Green, Blue, Indigo, and Violet ideas to get you in the rainbow mood. Flowers! My little man is definitely bringing these to his teacher to brighten her St. Paddy’s Day. I found every color of tulip in the rainbow, minus blue, at my local grocery store. (Of course the greenery counted as the green). Simply tie a big blue ribbon around the jar and you are set. A rainbow of happiness ready to go. Candy! Oh jelly beans. You can find them just about everywhere this time of year. Who doesn’t love this candy that is a sure sign of Spring?! My kids, aka taste testers, loved helping to sort the colors and then dumping them in the jar layer by layer. Skittles are a great filler for this idea too! And last, but definitely NOT least, CAKE!! I simply used 2 T of batter in each muffin tin, added color, and BAM! Super easy! It’s a piece of cake really (ha ha, I’m a dork). And I’m pretty sure there are at least 999 other ways to fill a jar with a rainbow. If you have any ideas, please leave them in the comments! We’d love to hear! So where is your exclusive free “St. 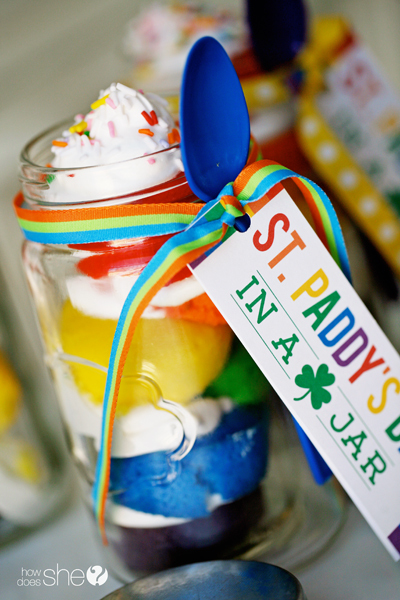 Paddy’s Day in a Jar” printable? If you are already a HowDoesShe email subscriber, it’s already waiting for you in your inbox. Simply click the link provided, use the secret password, and you will gain access to not only this printable, but our whole exclusive printable collection. If you aren’t an email subscriber, join us! You’ll get access to these printables (along with all of our other FREE printable collection) once you’ve subscribed. We send an e-mail once a week updating you on our creative posts. Don’t worry, we treat our e-mail subscribers right. We promise to never EVER sell your e-mail address. We’ve created quite the collection of exclusive printables. It’s getting BIG!!! We hope you are loving them and USING them! A special thanks to chickabug, who has created every last set. She is an incredibly talented graphic designer whom we adore. Make sure to check out her personalized party themed printables in her shop. She has it all and she has you covered. I promise. Lastly, thank YOU for supporting HowDoesShe! We are truly grateful for each one of you. We hope the Luck of the Irish is headed your way this St. Paddy’s Day. Oh! And don’t forget to print these Free St. Patricks Day Printables out from last year. They are perfect to help protect you from pinching, to decorate for the big day, or help with class parties. Shelley is one of the three founding editors of How Does She. She’s a spunky wife & mother of five, an interior design guru, and a party throwing queen. She loves cooking for crowds, eating good food, and dressing up like a girly girl. Oh how cute are these! I will definetly be doing these this year. 🙂 Thank you for sharing. Such a fun idea!! I love the free printables. I really appreciate your free printables. They are so well done and give my crafts, cards, gifts, and scrapbook pages real pizazz ! Thanks. Hi! Check your email, I just sent you more info. Thanks!